Liechtenstein is a doubly landlocked microstate in Central Europe. The Swiss franc is Liechtenstein's currency. Liechtenstein is 25 kilometers (15.5 miles) long principality between Austria and Switzerland. 90% of the energy requirements of Liechtenstein are imported from other countries. Official name is the Principality of Liechtenstein. Agricultural products grown and produced in Liechtenstein include wheat, barley, potatoes, corn, dairy products and livestock. Liechtenstein is responsible for a large percentage of the false teeth produced worldwide. It has an area of just over 160 square kilometers (62 square miles). Approximately 50% of the employees in Liechtenstein commute daily from Germany, Switzerland, or Austria. Liechtenstein has the third highest income per capita in the world following Qatar and Luxembourg. There are 380 km of roads and 9 km of railway in Liechtenstein. There are only 28 km of waterways in the small country. As of 1 January 2016, the population of Liechtenstein was estimated to be 37,622 people. There is no military force in Liechtenstein. There is a National Police force. The principality of Liechtenstein is divided into eleven municipalities, most consisting of only a single town. Liechtenstein was the last country in Europe to allow women to vote in elections. Liechtenstein is a popular tourist destination. Winter activities such as skiing and snowboarding are popular. Liechtenstein's national colors are blue and red. The flag is red and blue with the prince's crown in gold. Without the gold crown the flag is too similar to Haiti's flag and it was added to help with the distinction. Warm weather activities include hiking and biking in the mountainous country. Vaduz Castle is the palace and official residence of the Prince of Liechtenstein.It lies on a hillside 120 meters (394 feet) above Vaduz.It is commonly believed to have been founded circa 1322 by the Counts of Werdenberg. 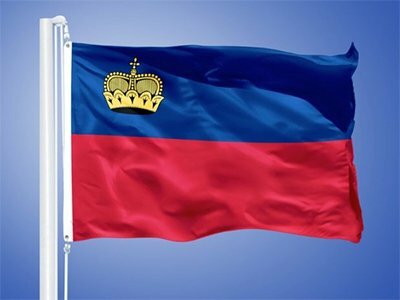 To become a Liechtenstein citizen one must be born to a father who is a Liechtenstein citizen, or if born to a single mother the mother must be a Liechtenstein citizen. Just being born in the country does not give a baby citizenship in Liechtenstein. Gutenberg Castle is a preserved castle in the town of Balzers, Liechtenstein, the centre of the municipality of Balzers.The castle stands about 70 meters (230 feet) above the nearby village, on a hill which has been inhabited since the Neolithic Period. Liechtenstein is divided into 11 communes including Vaduz, Triesenberg, Triesen, Schellenberg, Schaan, Ruggell, Planken, Mauren, Gamprin, Eschen, and Balzers. There is five castles of the principality but only two have survived preserved until the present day Gutenberg Castle and Vaduz Castle. Vaduz Cathedral, or Cathedral of St. Florin, is a neo-Gothic church in Vaduz, Liechtenstein, and the center of the Roman Catholic Archdiocese of Vaduz. Originally a parish church, it has held the status of cathedral since 1997. The government in Liechtenstein is a hereditary constitutional monarchy. The civil law system is based upon German, Austrian, and Swiss laws. The Kunstmuseum Liechtenstein is the state museum of modern and contemporary art in Vaduz, Liechtenstein.The building by the Swiss architects Meinrad Morger, Heinrich Degelo and Christian Kerez was completed in November 2000.The museum collection of international modern and contemporary art is also the national art collection of the Principality of Liechtenstein. The main religions practiced in Liechtenstein include Roman Catholic, Protestant Reformed, Muslim, and Lutheran. The official language in Liechtenstein is German. The Grauspitz is a mountain in the Rätikon range of the Alps, located on the border between Liechtenstein and Switzerland. With an elevation of 2,599 meters (8,527) feet above sea level, the Grauspitz is the highest mountain in Liechtenstein. Approximately 43% of Liechtenstein is forest, and 37% is agricultural. An alpine country, Liechtenstein is mainly mountainous, making it a winter sport destination. Despite its small size, Liechtenstein is home to an exceptionally wide range of animals. Around 55 mammals are native to Liechtenstein (Switzerland has 83), including 17 species of bat, 140 species of bird, 7 species of reptile, 10 species of amphibian and 24 species of fish. The national animal of Liechtenstein is kestrel. Liechtenstein is considered to be a mountainous country. It experiences cold winters and humid, moderately warm summers. The Principality of Liechtenstein was established within the Holy Roman Empire in 1719. In 1815 Liechtenstein becomes a member of the German Confederation until 1866. In 1866 Liechtenstein becomes fully independent. The state coat of arms is identical to the Princely Family’s coat of arms. Liechtenstein's full name is the Principality of Liechtenstein. It was named after the Liechtenstein dynasty that united Vaduz and Schellenberg after purchasing the small countries. The Roman Empire allowed the family to rename the country Liechtenstein in 1719, which means 'light stone' in German. It owes much of its wealth to its traditional status as a tax haven, though it has in recent years taken steps to shake off its image as a tax haven and to reposition itself as a legitimate financial centre. Liechtenstein is a large producer of ceramics and is the largest producer of false teeth in the world. The unemployment rate is one of the lowest in the world at 1.5%. Liechtenstein has one of the world’s lowest crime rates, with its last murder occurring in approximately 1997 and its prison holding very few inmates. Citizens who are given prison sentences longer than two years are transferred over to Austria. The entire country of Liechtenstein can be rented for $70,000 a day. Snoop Dogg once tried to rent the entire country of Liechtenstein for a video shoot, and the main reason they said no is because he didn’t give them enough notice. During Liechtenstein’s last military engagement in 1886, none of the 80 soldiers sent were injured, and 81 returned, including a new Italian “friend”. On 5 December 1985, rockets fired by the Swiss Army landed in Liechtenstein, causing a forest fire. Compensation was paid. In 2007, Swiss troops accidentally invaded its neighbor Liechtenstein after getting lost in a rainstorm. On Liechtenstein’s national holiday, His Serene Highness Prince Hans-Adam II, the head of state, and his son, His Serene Highness Hereditary Prince Alois, invite the residents of their tiny principality to have a beer in the garden of Vaduz Castle, the princely ancestral residence.